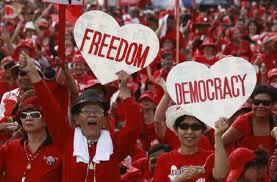 THE Red Shirts are now gone from the centre of Bangkok and things are returning to normal. Hopefully, the new normal won’t be one where the poor and disenfranchised rural voters are again marginalised and neglected. The Red Shirt uprising is another reminder that we are living in an age defined by the readiness of ordinary people to confront the powers that be, whether brutal dictatorships or entrenched elites, in order to secure their basic rights. In 1986, the people of the Philippines rose up against the regime of President Ferdinand Marcos. More than two million Filipinos demonstrated and prayed until a 20-year authoritarian regime crumbled. The Philippine “yellow revolution” or People Power movement arguably inspired a series of non-violent uprisings across the world. In 1989, after years of political repression, the Polish people, led by trade union leader Lech Walesa, rose up against an authoritarian regime and forced its demise. The momentous events in Poland continued and in a single year mass uprisings led to the overthrow of authoritarian regimes in Hungary, East Germany, Bulgaria, Czechoslovakia (the Velvet Revolution) and Romania. Except for Romania, all the regimes were overthrown by non-violent civil protests. The year 1989 was also the fateful year of the Tiananmen Square protests that shook China. In 2003, the Georgian people launched their successful Rose Revolution when the state tried to steal their vote. In 2004 the Ukrainian people took to the streets to protest the massive fraud that attended presidential elections. The Orange Revolution finally brought the first democratically elected president to power. The assassination of Prime Minister Rafik Hariri in February 2005 ushered in the “Cedar Revolution,” as thousands of Lebanese took to the streets of Beirut demanding an end to Syrian control and interference. Faced with strong domestic and international pressure, Syria completely withdrew the 14,000 troops it had stationed in Lebanon. In March 2008, Tibet erupted in protest following the 49th anniversary of the 1959 Tibetan Uprising. Hundreds of lamas as well as ordinary people took to the streets demanding their basic rights. It doesn’t take a China scholar to know that Tibet will always remain a problem until a measure of justice is granted the Tibetan people. In 2009, the world witnessed a “green revolution” as the brave people of Iran took to the streets to defy an authoritarian regime that had long suppressed them in the name of religion. The regime may have won the first round but the green revolution is far from over. Governments facing down their own people often scream about outside interference, warn of instability, chaos and economic hardship, and insist that the law must be upheld. To be sure, agencies like the CIA have a long and dark record of interference, but it is genuine and longstanding local grievances that finally drive people onto the streets in protest. They respect the law but when the law becomes a tool of oppression they are apt to disregard it. When ordinary people come to the conclusion that the enemy is the state or that the existing political structures no longer afford them a legitimate way to find redress, all bets are off. True, the common people are often manipulated and misled by unscrupulous politicians. For sure, they can be naïve and fickle. They most certainly make mistakes and sometimes end up choosing leaders that are as inexperienced as they are, even leaders as corrupt as the ones they replaced. Thanks to the Internet and other forms of global communication, ordinary people have seen what their collective power can achieve and they are energised by it. People of colour – yellow, red, green, velvet, orange, saffron, and colours yet to emerge – are profoundly redefining the political process. It seems there’s a little colour in all of us.